I also had to google more about the family. So interesting! I did not notice you Iin the picture until you mentioned it. 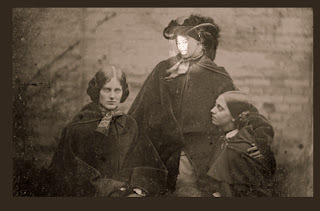 I heard that was a good program about the Brontes. Laterwhen I am on a different computer I will come back with a link to another blogger who wrote about it in case you are interested in reading more. Yes, the program was interesting and a great production. Whoa, clever! I haven't watched it - sounds like something I would be interested in. Give it a go. I think you will like it. I guess they have an intriguing story when you look into it. It's funny where our particular passions come from. Sometimes there isn't an obvious explanation. I thought about exploring the possibility that some people just have an innate talent for writing. I just watched it recently and loved it. Great choice of topic for a "B" post. 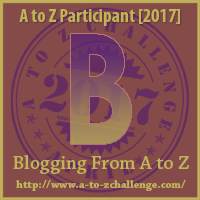 I dropped by from the A to Z blog challenge and enjoyed your post. Thanks. Thanks for stopping by. It was a good show, for sure. I'll have to look for that. It sounds like something I'd enjoy. Oh, I think I would love to visit Howarth and the parsonage. Perhaps some day.